What makes this egg and mashed potato salad unique taste-wise? It’s the secret ingredient inside that will make my family want more of it. That’s the Japanese mayonnaise, listed below in the recipe. You can get it from any Asian grocers. If you're curious enough, here's a post from pogogi.com, "What Is Japanese Mayonnaise and How Is It Different from American Mayo?" Ever wonder why most kids are quite hard to be convinced to eat more vegetables? What many parents I know share the common trick of how to get kids eat more vegetables is to hide them somewhere in the dish. Besides, I find another trick that works for my family is to make this creamy potato salad. 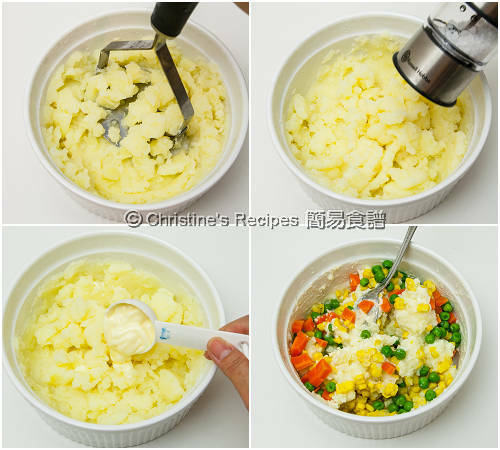 I can blend as many veggies with the creamy mashed potato as I like. My daughter even asked for more and wanted to have it again for lunch the next day. I definitely won’t let her down upon this kind of request. Blanch the diced carrot, green beans, corn kernels in boiling water for about 3 minutes. Drain well. Set aside. 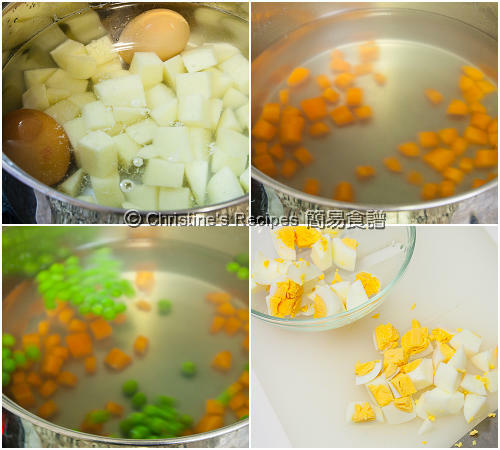 Place the eggs and diced potatoes in a pot, covered with cold water. Add 1 teaspoon of salt. Turn on the stove heat and cook over medium-high heat. Bring it to a boil. Continue to cook for 10 minutes. Drain up the eggs and immediately soak in cold water until cool to touch. Peel the shells and dice the cooked eggs. Set aside. Continue to cook the potato until they are softened. Test with a sharp knife. If it’s easy to poke in, it’s done. Drain up and mash into creamy texture. Or you might like to retain some potato textures. Season with salt and pepper. 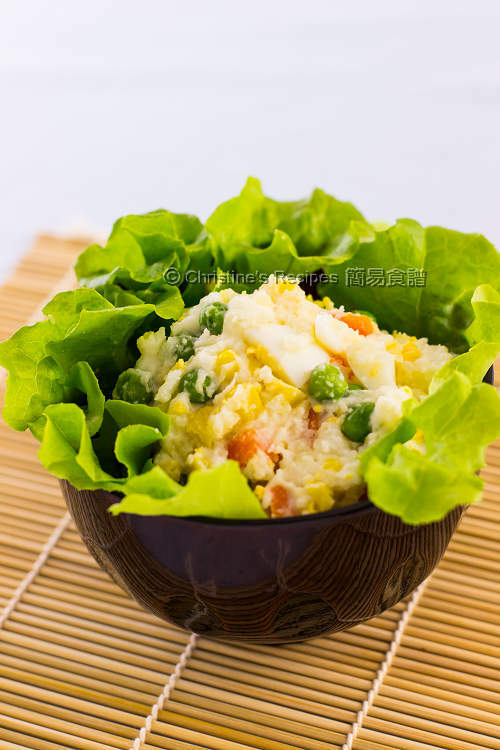 Mix in carrot, green beans, corn kernels, mayonnaise. Combine well. Gently mix in the eggs. Serve warm or cold. Enjoy. I steamed one fresh corn and cut the kernels out. They tasted heavenly wonderful. To get the best results, try to get the Japanese mayonnaise (Kewpie Mayonnaise), available at Asian grocers. It tastes very good. If you can’t find it, you can replace with any other brand that comes in handy for you. I've never really had much of a problem with veggies, even as a kid because I always liked them :D Strange kid huh? 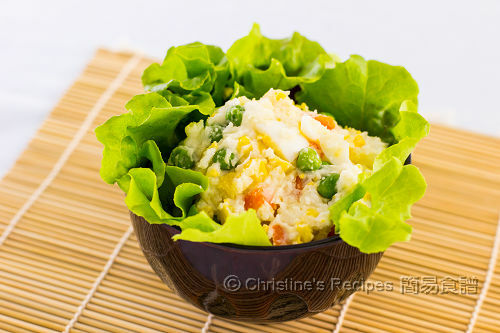 And I love japanese potato salad! :( Unfortunately no one in my family shares the love, so I've never really been bothered to make it haha.....Yours looks so yummy I might just make a small serving for myself! The salad looks quite filling and delicious! I used chopped long green beans instead of グリーンピース. I did not use corn this time. I also added a pinch of S&B oriental mustard powder and white pepper. This is such a great salad for when the weather is warm!! Thank you for reminding me of something my mother used make! !